This rendering that shows the standard design of Ernest Health’s rehabilitation hospitals. 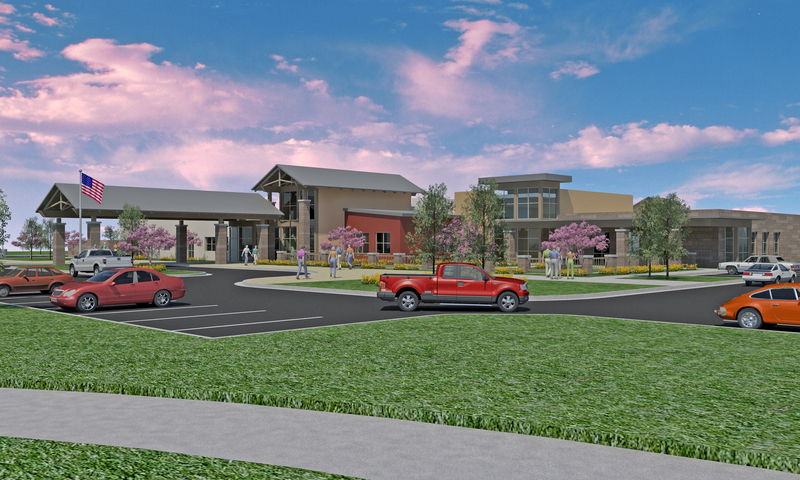 The Boulder Community Health-Ernest Health rehab hospital to be built in Lafayette will follow this design. Courtesy Boulder Community Health. LAFAYETTE — Boulder Community Health announced on Wednesday it plans to partner with Albuquerque-based Ernest Health Inc., to build a free-standing 40-bed rehabilitation hospital in Lafayette. Currently, BCH operates a 14-bed rehabilitation unit at its Broadway and Balsam campus. BCH sold that site to the city of Boulder in 2015. BCH will continue to provide services at that site during the planning and construction of the new hospital. When the hospital opens, BCH will stop directly providing inpatient rehabilitation services. BCH spokesman Rich Sheehan said BCH plans to purchase several acres for the $24 million project. “Boulder Community Health has a long history of providing our community with inpatient rehabilitative care that melds compassion with the highest medical quality,” Dr. Robert Vissers, president and chief executive of BCH, said in a prepared statement. “Our new vision is to partner with like-minded organizations that can help us make Boulder the healthiest community in the country. The new hospital will offer rehabilitative services to patients recovering from or living with disabilities caused by injuries, illnesses or chronic medical conditions, including strokes, brain injuries, orthopedic injuries, Parkinson’s disease, multiple sclerosis. The partnership will enable BCH and Earnest Health to jointly increase inpatient capacity by 300 percent, providing 40 private rooms for patients rather than the 10 rooms BCH was intending to provide in the future, according to a prepared statement. The new hospital will feature private rooms, a 6,000-square foot gym and an outdoor therapeutic courtyard. Ernest Health operates 25 post-acute hospitals, which include 17 rehabilitation hospitals. Ernest Health’s rehabilitation hospitals are accredited by The Joint Commission, and many have voluntarily earned The Joint Commission’s disease-specific certifications in stroke, hip fractures, brain injury and amputation rehabilitation. BCH’s rehabilitation program is accredited by The Joint Commission and CARF, International. Foothills Hospital has disease-specific certifications in stroke and knee/hip replacement. With the nearest rehabilitation hospitals in Denver and Loveland, the new rehabilitation hospital will treat patients primarily from Boulder, Louisville, Lafayette, Longmont, Broomfield, Westminster, and Thornton. It is expected to treat more than 900 patients every year and create about 120 jobs. Groundbreaking for the hospital is expected to occur this fall, with the hospital opening 12 to 15 months later.